This moulded tile is a tomb marker. Important tombs were often covered by large markers made of stone, wood, or tile, as here. The arched design is a miniature representation of the mihrab, the niche in a mosque that marks the direction of Mecca. The mihrab design showed that the deceased was buried in accordance with Islamic law, oriented towards the Ka'bah in Mecca. 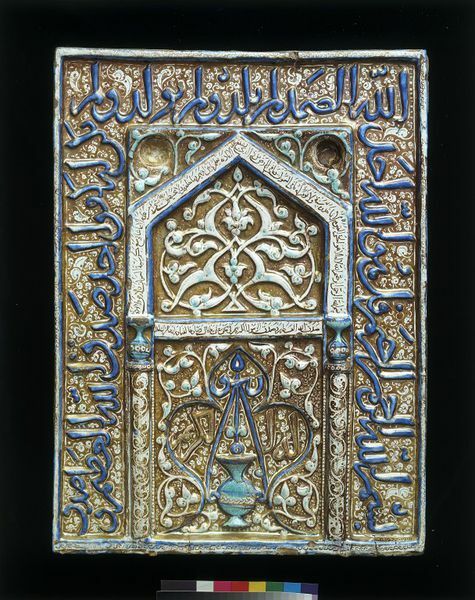 The framing inscription in blue on this tile contains the 112th surah, or chapter, of the Qur'an. It is called ‘al-Ikhlas’ (Purity of Faith). Single-tile mihrab, fritware with overglaze decoration in lustre and cobalt blue, with inscription running along border and a hanging lamp inside the niche. Throughout the nineteenth century works of art from tombs and other religious buildings were removed and traded on the art market in Iran. Lustre tilework was regarded as of exceptional quality and was particularly attractive to dealers and collectors. As a result, a good deal of it has ended up in museums in Iran and abroad. This superb tile was bequeathed to the South Kensington Museum (now the V&A) by George Salting on his death in 1909. Salting was one of the most important collectors of the decorative arts in London in the last decades of the nineteenth century, and his acquisition of this tile reflects his interest in Islamic ceramics. His bequest greatly enriched the Museum's collections in this area. This tile is a pair with another tile in the V&A (1527-1876), though the inscriptions are not identical. 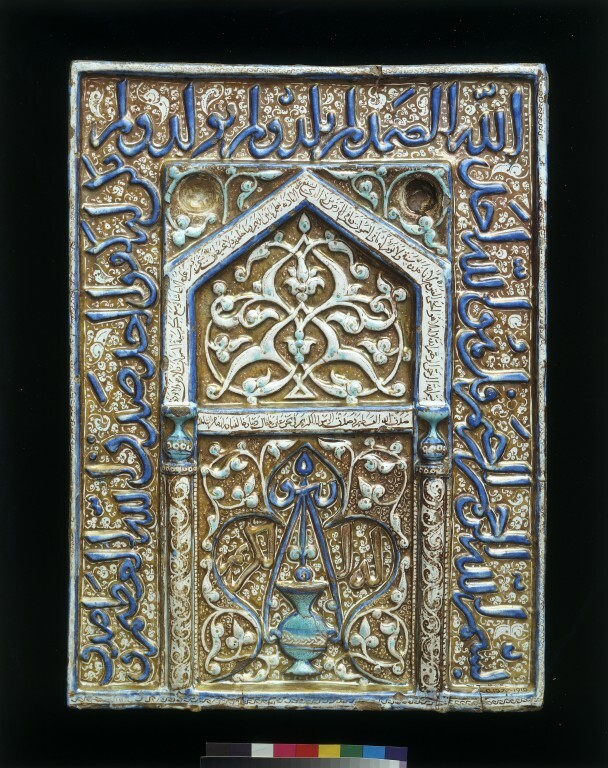 The other tile is signed by the artist Ali ibn Ahmad ibn Ali al-Husaini, so this one may be assigned to him as well. Both tiles depict a mosque lamp suspended in a niche, a motif which recalls the Qur'anic "light" verse (surah 24, verse 35): "Allah is the light of the heavens and the earth. The parable of his light is as if there were a niche and within it a lamp, the lamp enclosed in a glass, the glass as it were a brilliant star". This motif was especially popular in Shi'i mosques. The actual inscription on this mihrab tile is also from the Qur'an, from surah 112 along the outer border, and surah 2, verse 255 inside the arch. Both these verses emphasise the supremacy, omnipotence and unity of Allah. Single-tile tomb-marker in the form of a mihrab, Iran (probably Kashan), about 1300. Earthenware painted in lustre, blue and green. 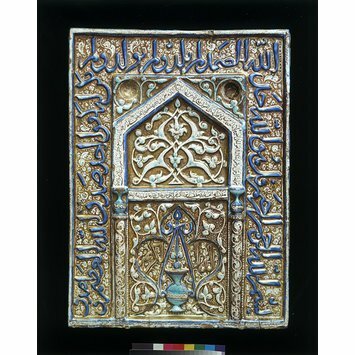 This tile is a representation in miniature of the mihrab, the niche in a mosque that marks the direction of Mecca. The mihrab design showed that the deceased was buried in accordance with Islamic law, oriented towards the Ka'bah in Mecca. The framing inscription in blue contains the 112th surah, or chapter, of the Qur'an, called al-Ikhlas (Purity of Faith). Attributable to Ali ibn Ahmad ibn Ali al-Husaini, who signed the pair to this piece (1527-1876).